Here at TGtB we list all major events happening in Bath over the coming weeks and months, these include; theatre, live music, club nights, sport, networking, comedy shows, festivals, exhibitions, charity events and many, many more. 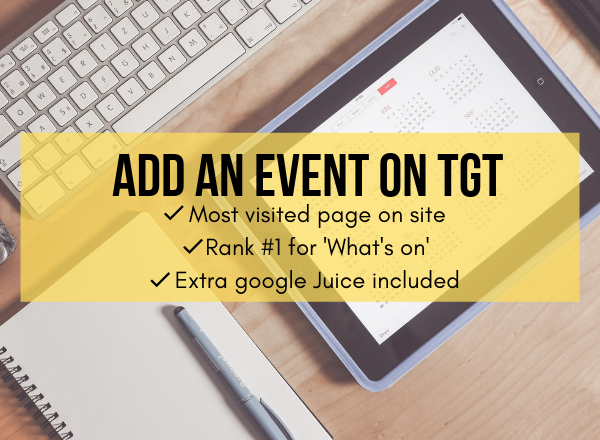 If you have an event happening in or around the local area, then you need to get it listed on our Events Calendar – we are #1 on Google for what's on Swindon no wonder it's the most viewed section of the site! Event uploads are priced at £25+VAT. Click below to pay now and we will be in touch once your event is listed. We include charitable/fundraising events free of charge. Click here to submit your Charity/fundraising event. Charity/fundraising submissions will automatically be forwarded on to our admin team to add, all others will be passed on to the events team once payment has been made who will then be in touch once it's listed. Click the following links to view our Rate Card and Media Pack to see the array of digital services we can offer to help you gain maximum exposure for your event and/or business.